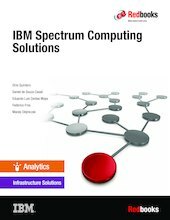 This IBM® Spectrum Computing Solutions Redbooks® publication is a follow-up book to update each of the available offerings that are part of the IBM portfolio of Cloud, analytics, technical computing, and high-performance computing (HPC) solutions for our clients. This publication delivers descriptions of the available offerings from IBM Spectrum™ Computing (formerly IBM Platform Computing) that address challenges for our clients in each industry. We include a few implementation and testing scenarios with selected solutions. This publication helps strengthen the position of IBM Spectrum Computing solutions with a well-defined and documented deployment model within an IBM Systems environment. This deployment model offers clients a planned foundation for dynamic cloud infrastructure, provisioning, large-scale parallel HPC application development, cluster management, and grid applications. This book is targeted toward technical professionals (consultants, technical support staff, IT Architects, and IT Specialists) responsible for delivering cost effective cloud services, big data, and analytics solutions on IBM Power Systems™ helping to uncover insights among client's data so they can take actions to optimize business results, product development, and scientific discoveries.